» Woman, YOU are talent! I have always believed there was more to me. Deep down inside, I knew that there was a purpose to all the madness, there was a reason for every season and that I was yet to make my mark. In between all the daily challenges, that belief remained within me, however, in the first half of 2015 that inner belief was challenged. Getting nominated in a competition recognising young talent in the workplace was something I never really thought I could be eligible for. I mean – all things being equal- I am a woman in a male dominated environment and every day I am subconsciously reminded that I have to work that much harder and get criticized that much more than my male counterparts. Of course feelings and facts can be very different and so I try not to dwell on it too much. I quietly think to myself: maybe it’s just a woman thing- or a Thuli thing- but sometimes I have these negative conversations in my head and just when they are about to encroach on the work I have to produce or the deadlines I have to meet , I have to convince myself never to give up. 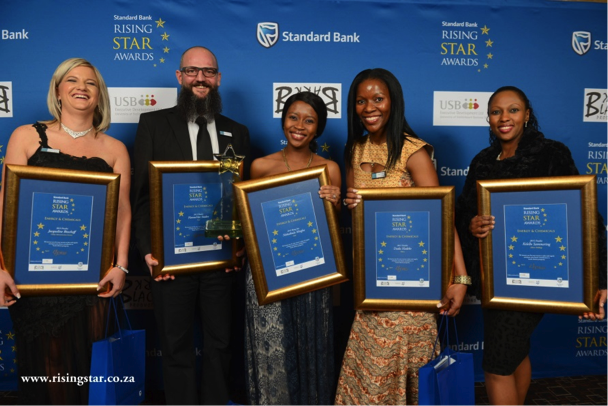 So when I received the nomination for the Standard Bank Rising Stars competition I was amazed. I didn’t expect it. I am in a new role and all the Key Performance Indicators (KPIs) seemed to be working against me L…2015 has been a rollercoaster ride, and the reality is that I was not feeling like “talent”. So this was the real thing, across sectors and across industries, and it would culminate in a black tie event…and I was invited…wait… I was a nominee and eventually a finalist! Fancy That. Fast forward to two written assessments and a very stressful interview later and here I am. I was part of the Chemicals and Energy Category together with some very impressive individuals. My title (Supply Planner Lead) paled in comparison to the Chief Engineer, People and Organisational Consultant, Operations Director and Governance and Reporting Manager who were also finalists, but I had made it. The Gala dinner was very fancy, much fancier than I had thought and made me relieved that I had put in extra effort. I was chosen as the Chemicals and Energy Category winner for 2015. Blessed is an understatement considering all the doubt and challenges I am up against daily! See yourself as the talent you really are – most of our limitations are not instilled by the system, by our managers, by males, or even by other females. Most of the limitations we experience are due to personal flawed thinking about our abilities and what we can offer. Run your own Race– Do not compare your journey to or even bother to compare yourself with someone else. I remember telling a colleague about the competition and how I was now a finalist and she asked me “Have you googled your competition?” and I thought…”Ummm No”. I am so glad I didn’t. In retrospect, the competition was stiff, these people were seasoned professionals who were achieving so much in their careers at a young age- I couldn’t even compare myself. I would have been crippled with fear. I would have seen myself as small in comparison- as less, and I really didn’t need that stress. In fact, I think I did better by not knowing the competition. When I saw my female counterparts I was proud because by then we were equal, we all deserved to be there and we gladly wished each other the best. Work on You – You must believe that you are talent, and see the God given gifts and abilities you have. But, it’s not enough. There are so many areas where one can improve. I struggle at times, because any self-improvement relies on an essence of vulnerability- to admit that there are areas in which I can be better. I am forcing myself to be surrounded by people who challenge me and deliberately put myself in situations where I can grow. In work setting it means being on projects, meetings and teams that will stretch you…and being deliberate about it- at work we sometimes have to fight. Recognise Opportunities– Opportunities come to those who are willing to take them. Remember “Time and Chance” are given to all. We have to recognize the opportunities and pursue them and literally not only when they look good. Even when we don’t see the point, or think it is a waste of time, take all things that happen as building blocks. Be you- I went in the competition wanting to present myself in the best possible light, but not wanting to misrepresent who I am. Hence, even in the preparation I said to myself that I would not pretend to know more than I did, I would present my opinions as such and the work I have done as such. I know that people realise quite soon when someone is putting up a front, and I am really not into that. When authentic- real communication- happens it leaves an incredible memory of the real you to the world. I am thankful; to the people and networks this opportunity will give me access to, the conversations, the mentoring and the skills that will come and I will have to use this opportunity as a stepping stone to growing in myself and my career. More than that I see this as an opportunity to impact the lives of other women like yourselves, who have read till the end. Enter the competitions, do your best, and you never know what may come out of it! Go for it you have nothing to lose! WOMAN, YOU ARE TALENT! 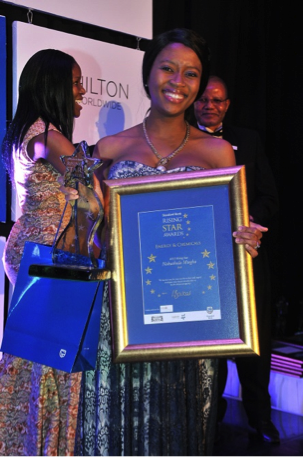 Article by: Nokuthula Joy Mtegha | Supply Planner Lead at Shell SA Refining||Nokuthula is an APICS Certified Supply Chain Professional who holds an Industrial Engineering degree (WITS) and a Post Graduate Diploma in Business Administration (GIBS). She has worked at Shell for the last 4 years in the Lubricants Supply Chain and previously worked at Anglo American Thermal Coal in Asset Optimisation.